Donald Trump has indicated that the US economy needs a big tax cut to stimulate some growth and aggregate demand – C+I+G+(X-M). His rationale is that with consumers having greater income they will spend consume more (C) and businesses keeping more of their profits will invest more (I). He is even so confident that the tax cuts won’t put a dent in the overall tax revenue of the government. However economists are suggesting that the US economy is already growing as fast as it can and in order to improve its growth rate it needs to investment in productivity. Nevertheless, US tax cuts in the 1980’s under Ronald Reagan proved to be very effective in stimulating aggregate demand but the economic environment then was different to that of today. The 1980’s was an era of stagflation with the US experiencing 10% unemployment and inflation reaching 15%. Since the GFC in 2007 growth has been positive and unlike the 1980’s unemployment has been falling – from 10% in Oct 2009 to 4.4% in April 20178. Tax cuts are all very well when you have high unemployment but with the rate falling to under 5% companies may find it difficult to respond to the greater demand for goods and services by taking on workers to increase supply. Tax cuts would then lead to an increase in inflationary pressure (see graph) which is turn would prompt the US Fed to increase interest rates. Trump’s plan would also increase the Federal deficit and borrowing from the government. This would put upward pressure on interest rates for the private sector which reduces the potential for further growth. As noted earlier the area that needs to be addressed is productivity, with a shift of the LRAS curve to the right – see graph. This entry was posted in Growth, Inflation, Interest Rates and tagged Tax, USA on May 14, 2017 by Mark. Former US President Ronald Reagan said that the US tax system was “complicated, unfair, cluttered with gobbledygook and loopholes designed for those with the power and influence to hire high-priced legal and tax advisers”. Paul Solman of PBS News, looks at the US tax system in the video below and compares it to other countries. Even Paul Ryan, Speaker of the House states that the USA has the worst tax code in the industrialised world, bar none. T.R.Reid, author, “A Fine Mess” suggests that New Zealand is a model of good tax policy. “They have done what all the economists think is right, to get a tax code that is simple, fair and efficient”. He mentions the BBLR – broaden the base, lower the rates. You broaden the base by making everything taxable – health insurance, car park, pension contribution. By contrast Americans spend about six billion hours a year collecting the data and filling out the forms. They spend $10 billion to H&R Block and other preparers and, on top of that, $2 billion in tax preparation software, which still takes hours of work. Furthermore there are more than 400 additions to the tax code every year, and most of them are giveaways to one or two taxpayers. Of the 35 richest countries, in total tax burden, U.S. ranks 33rd. And in return, the US government spends less as a percentage of GDP than other governments. Canon of Equality. Equality here does not mean that all tax-payers should pay an equal amount. Equality here means equality or justice. It means that the broadest shoulders must bear the heaviest burden. Canon of Certainty. The individual should know exactly what, when and how he is to pay a tax. Otherwise, it causes unnecessary suffering. Similarly, the State should also know how much it will receive from a tax. Canon of Convenience. Obviously, there is no sense in fixing a time and method of payment which are not suitable. Land revenue in India is realized after the harvest has been collected. This is the time when the cultivators can conveniently pay. Canon of Economy. This means that the cost of collection should be as small as possible. If the bulk of the tax is spent on its collection, it will take much out of the people’s pockets but bring little into the State’s pocket. It is not a wise tax. This entry was posted in Uncategorized and tagged Canons of Taxation, Tax on April 15, 2017 by Mark. Why increasing taxes in developing economies may help growth. In order to assist growth higher taxes may seem illogical as they take money out of the circular flow. However developing countries on average collect only 13% of GDP in tax compared to 34% in developed countries. Public investment can encourage private investment and it is estimated that an $1 of public investment increases private investment by $2. At the recent UN conference in Addis Ababa there is a desire to increase the tax take of LDC’s to 20% of GDP. Why do developing countries not collect much tax? The World Bank has suggested improving the tax agencies and tax revenue in Rwanda has increased by 6.5 time after automating the process, which reduced errors and opportunities for fraud. There would be much more tax revenue if LDC’s reduced tax emption and avoidance, including from foreign investors. It is estimated that exemptions have cost developing countries $1bn in lost revenue in 2011 whilst the cost of multinational companies deliberately avoiding tax exceeds $200bn a year. The most common way multinationals avoid taxes is through “transfer pricing”, in which their subsidiaries in tax havens buy goods cheaply from arms in more exacting countries, and then sell them on at a higher price, thereby shifting profits to the tax haven. The OECD is trying to combat such schemes by persuading tax authorities to require firms to disclose where they generate their profits and share the disclosures. A proposal from 137 developing-world NGOs goes further, calling for the formation of an international tax agency, although it is unlikely to prosper. This is a major problem as undeclared money transfers, false invoices etc cost developing countries more than $990 bn in 2012 which equates to almost 4% of a developing countries’ GDP. This entry was posted in Development Economics and tagged Tax, tax avoidance on October 4, 2015 by Mark. 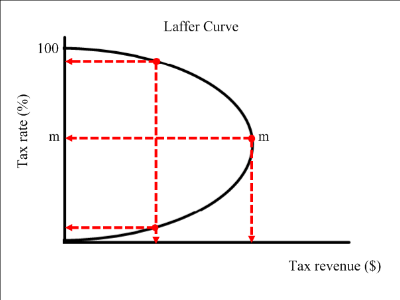 • The supply curve shifts vertically upwards(effectively a shift to the left) by the amount of the tax(gf) per unit. The price increases but not by the full amount of the tax. This is because of the slopes of the demand and supply curves. • The consumer surplus is reduced from acp to agb. The portion gbhp of the old consumer surplus is transferred to government in the form of tax. • The producer surplus is reduced from pce to fde. The portion phdf of the old producer surplus is transferred to the government in the form of tax. • The market is no longer able to reach equilibrium, and there is a loss of allocative efficiency resulting in the deadweight lost shown by the area bcd. This represents a loss of both consumer surplus bhc and the producer surplus hcd that is removed from the market. The deadweight loss also represents a loss of welfare to an individual or group where that loss is not offset by a welfare gain to some other individual or group. This entry was posted in Exam revision, Fiscal Policy and tagged GST, Tax on September 28, 2015 by Mark. * Bakers were concerned with fat content in their cakes. * Pig farmers said their famous bacon would cost more than imports. * Independent butchers complained that supermarkets could keep their meat prices down as they could spread the cost of the tax across other goods. * The tax applied on meat was imposed by carcass not per cut, which meant higher prices for lean sirloin steak as well as fatty burgers. However there was also a surge in cross border shopping and a study estimated that 48% of Danes had done shopping in Germany and Sweden – sugary drinks, beer, butter etc were no doubt high on the shopping list. This entry was posted in Fiscal Policy and tagged Denmark, European Economies, Fat Tax, Tax on January 6, 2013 by Mark. I like this graphic from The Economist as not only does it display the significant increase in inequality but also the changes in economic systems that were prevalent during the time period. Notice after 1930 the drop in the income levels of the top 10% and 1% earners. This can be partly explained by a return to a more dominant role of government. However after 1980 we see the impact of Reagan and Thatcher and the policy of less government and deregulation. This was especially evident with the repeal of the Glass Steagal Act in the US and Big Bang in the City of London. The top 10% of American earners brought in 46% of the nation’s salary income in 2007. Top 1% of earners income has increased by 11.6% – bailout packages and bonuses? The other 99% of earners income has increased by just 0.2%. Obama intends to tackle this problem with increasing the top marginal tax rate to 39.6% of the late 1990’s. Between 1932 and 1944 the tax rate on top incomes rose from 25% to 94%. I think there is little chance of that happening especially with the impending election. This entry was posted in Inequality and tagged Big Bang, Glass Stegal Act, Tax, USA on April 17, 2012 by Mark.